Leila C. Dimmer, age 94, of Nelson Drive, Port Washington, WI passed away peacefully Saturday, September 13, 2014 at the Harbor Club, Port Washington where she has resided since April, 2014. She was born on April 9, 1920, daughter of William and Anna Karrels Freiman in Belgium, Wisconsin. As a young woman, Leila left Belgium for work in Chicago, IL at the AETNA Casualty Insurance Company. She would return home regularly, keeping ties with family and friends. On July 6, 1953, Leila married Ervin N. Dimmer of the town of Port Washington at St. Lawrence Catholic Church in Chicago. They later moved back to Belgium, raising their family. In 1967, the Dimmer’s moved to Port Washington. Leila was a homemaker and took great pride in her cooking and baking. For over 18 years, she worked in the student kitchen at Thomas Jefferson Middle School for the Port Washington-Saukville school district. She retired in 1986. Her husband worked there as well for many years. 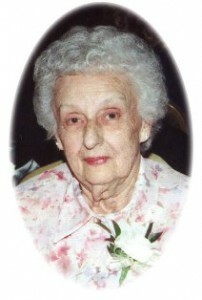 Ervin preceded her in death on June 9, 2011. She enjoyed tending her flowers and gardens around her home. She will be remembered for her love of family, as well as her independence and strength. She loved to go on bus tours with her husband in their retirement. Leila was a proud 75+ year member of Catholic Financial Life (Knights). Leila is survived by her son Mike (Sherrie) Dimmer of Port Washington; grandsons Brett (Jennifer) Dimmer of Port Washington, Shawn (Kathleen) Dimmer of Brown Deer and Evan (Katie) Dimmer of Bay View, great-grandchildren Matthew and Lily Dimmer, nieces, nephews, other relatives and friends. She is preceded in death by her husband Ervin, her son Richard Dimmer, her brother Harold Freiman, brothers-in-law and sisters-in-law Leo and Esther Croatt, Art and Olive Remick and Alphonse and Wilma Dimmer. A Mass of Christian Burial will be celebrated at 6PM Friday, September 19, 2014 at St. Peter of Alcantara Catholic Church, 1802 N. Wisconsin Street, Port Washington. Reverend Patrick Wendt will be the celebrant. Visitation will be from 4-6PM Friday AT CHURCH. Interment at St. Mary’s Cemetery in Port Washington. Memorials to charity of your choice appreciated. POOLE FUNERAL HOME/Crematory, Port Washington assisting the family. Information and condolences at www.poolefh.com or 262/284-4431.